Postoperative acute renal failure (ARF) is a serious complication which can result in a prolonged hospital stay and a high mortality and morbidity. Underlying renal disease, cardiac diseases, nephrotoxin exposure and renal hypoperfusion are the possible predisposing risk factors which can create a high probability for the development of ARF. The incidence of ARF is highest after major vascular, cardiac and high-risk thoraco-abdominal surgery. Among the various renal protection strategies, adequate peri-operative volume expansion and avoidance of hypovolemia is the most accepted and practiced strategy. Numerous bio-markers of renal injury are used to estimate the presence and extent of renal insult and various new are currently under trial. Traditional pharmacological interventions like dopamine, diuretics and calcium antagonists are not currently the first line of reno-protective agents. The new non-pharmacological and pharmacological methods may improve outcome in renal transplantation, contrast-induced nephropathy and in various other settings of ARF. The current review is an attempt to refresh the knowledge and put forth the various renal protection strategies during the peri-operative period. The need for revisiting these renal protection strategies was felt as the renal protection provided during the intra-operative period carries on to the postoperative period as well. The strategies are of immense significance to the surgeons also, as they have to manage such patients during the postoperative period. However, in a tertiary care center, renal protection is a multidisciplinary task by the involvement of various specialties during the peri-operative and postoperative period. For the present article a PUBMED and MEDLINE search was conducted using keywords: acute renal failure, acute tubular necrosis, renal protection, nephrotoxins, peri-operative renal protection strategies, and so on. Apart from indexed journals, peer-reviewed non-indexed journals were also analyzed. In-depth analysis was carried out by assessing the titles, abstracts, and/or the full-text papers retrieved from the electronic database, and manual searches for possible inclusion according to the predefined selection criteria. R- Risk , I - Injury, F - Failure and two outcome variables L- Loss and E - End stage that are based on the changes in serum creatinine or urine output. Renal failure is caused by a multitude of mechanisms and can be summarized as pre-renal, renal and post-renal failure. 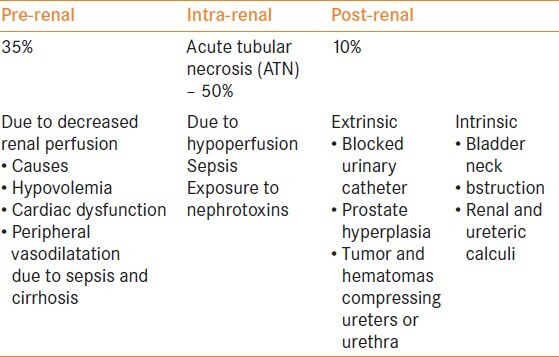 The causes can be classified as pre-renal, renal and post-renal [Table 2]. Initiation phase: This is the first phase of ATN and may last from a few hours to days and is characterized by decreased renal blood flow (RBF) leading to decreased GFR and finally decreased flow of filtrate in tubules due to obstruction by casts composed of shed epithelial cells and necrotic debris. The end results of these pathological changes cause back leak of glomerular filtrate through injured tubular epithelium. The prolonged duration of ischemia can be very detrimental to renal tissue and its consequences can be devastating [Figure 1]. Extension: It refers to a continuum of ischemic injury and inflammation of renal parenchyma and tubules. Maintenance phase: This phase can last from one to two weeks and is characterized by intrarenal vasoconstriction and medullary ischemia mediated through tubulo-glomerular feedback and deregulated release of vasoactive substance from injured endothelial cells. Recovery phase: It is characterized by tubular epithelial cells' repair and regeneration as well as a gradual return of GFR towards pre-morbid level. It may take several days to weeks. Systemic inflammatory response syndrome (SIRS) triggered by major surgery results in cell- mediated and cytotoxic injury. ATN may be exacerbated by renal embolic injury due to thrombus, air, lipid and tissue; aortic atheroma may get disrupted by operative manipulation. Renal excretion of haem derivatives produced by hemolysis in prolonged surgery may result in renal tubular injury. A sensitive marker for GFR. A novel marker for human renal proximal tubule injury. Biomarker of acute kidney injury in renal transplant recipients. An early diagnostic marker for acute kidney injury and predicts mortality in the ICU. A marker for acute renal injury after cardiac surgery. To identify and optimize patients at risk. To develop an appropriate anesthetic plan . Peri-operative usage of sensitive and specific monitoring tools of renal functions. To adopt efficacious interventions if renal function starts to deteriorate. Strategies to reduce the occurrence of renal injury in patients without evidence of acute renal dysfunction. Volume-non-responsive AKI. Real hypovolemia is the most common cause of volume-responsive AKI. It has been observed that intravenous hydration with saline was more effective than unrestricted oral fluid intake. Controversies have always existed in literature about infusion of colloids and crystalloids. The dilemma still remains hugely unanswered. Renal blood flow depends on both cardiac output and systemic arterial pressure. Initial approach should be to reverse hypovolemia. Inotropic therapy should be started for management of low cardiac output. A vasopressor such as norepinephrine is an excellent first-line vasopressor agent. Vasopressin and Terlipressin may be useful agents in the treatment of postoperative catecholamine-resistant vasodilatory shock. Minimum MAP of 65-75 mm Hg is often targeted in clinical practice, however, a higher target may be necessary in patients with pre-existing hypertension. It has been found that absolute hypotension (systemic blood pressure less than 90 mmHg is associated with development of AKI. But in many patients the episodes of hypotension are absent. 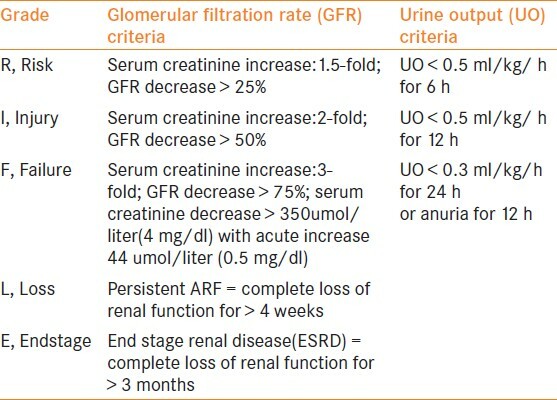 This form of AKI is called normotensive ARF , as auto-regulation of renal function is maintained at MAP 80-160 mm Hg. Hypotensive anesthesia is strictly contraindicated in CRF. Minimizing peri-operative exposure to nephrotoxic drugs is crucial in the prevention of ARF. Angiotensin-converting enzyme (ACE) inhibitors and angiotensin receptor blockers (ARBs) interfere with auto-regulation of renal blood flow and glomerular filtration rate. Therefore, patients chronically treated with ACE inhibitors have an increased risk of postoperative renal dysfunction. Non-steroidal anti-inflammatory drugs (NSAIDs) causes acute inhibition of cyclooxygenase (Type I or II) and can reduce GFR as well as peripheral blood flow. Antibiotics commonly associated with acute interstitial nephritis include Cephalosporins, Aminoglycosides and Vancomycin. Aminoglycosides like gentamicin can cause ATN and the use of once daily dosing reduces the incidence of tubular cell toxicity. Dosing should be based on creatinine clearance and peak and trough of drug levels. , Amphotericin B is also considered to be potentially nephrotoxic but its lipid formulations are less nephrotoxic. The use of aprotinin during coronary artery bypass grafting (CABG) surgery may be associated with an increased risk of ARF requiring dialysis. Prompt diagnosis and management of acute cardiac dysfunction, hemorrhage, sepsis, rhabdomyolysis and intra-abdominal hypertension are essential to prevent development of ARF. Rhabdomyolysis is a devastating complication which can precipitate ARF and such patients should be treated with aggressive intravascular volume expansion, diuretic therapy and urinary alkanization. Intra-abdominal hypertension is associated with diminished renal perfusion and may precipitate ischemic ATN. Timely recognition followed by decompresssive laparotomy may provide the optimal management. The concept of preconditioning is based on the principle that short periods of injury (i.e. ischemia) followed by reperfusion temporarily increase the resistance to further ischemic damage. It has been shown to occur in several organ systems including the brain, spinal cord, liver and kidney. Volatile anesthetics are also capable of producing preconditioning. Anesthetic preconditioning also occurs in endothelial and smooth muscles cells, implying the possibility that anesthetic preconditioning could have beneficial effects on a number of different organs in protecting against ischemic injury, including the kidney. Its role as a therapeutic strategy to prevent the development of ARF requires laboratory and clinical investigation. it can produce more significant reduction in creatinine value than dopamine. Induces preglomerular arteriolar dilatation leading to increased renal blood flow and GFR. Its administration during the re-warming phase of CPB in patients undergoing CABG decreases the incidence of postoperative ARF. Leads to volume depletion and hypernatremia - can increase hyper-osmolarity, volume expansion and hyperkalemia. Natriuretic peptides are used in renal protection because of their established protective role in preventing acute renal insult. The mechanism involved is - systemic and renal vasodilatation - inhibition of renal tubular sodium reabsorption - attenuating the activation of the rennin angiotensin aldosterone system - lowering the oxygen requirement in several nephrons. recently identified cardiac peptide of the ANP family - ameliorates ischemic ATN with regeneration of the brush borders of proximal tubules - induces endogenous production of PGE2 - causes maintenance of glomerular hemodynamic blood flow redistribution to the medulla and improvement of microvascular permeability. Statins: the effect of statins include - improvement of endothelial dysfunction - increased nitric oxide bioavailability - antioxidant properties - inhibitions of inflammatory responses. Growth Factors - these promote repair of tubular renal cells after sublethal or nephrotoxic damage- have antiapoptotic effects - these growth factors include epidermal growth factors, insulin-like growth factor I, hepatocyte growth factor, bone morphogenetic protein 7. Clinical trials are being performed with erythropoietin in the prevention of AKI post cardiac surgery, CIN and post kidney transplantation. 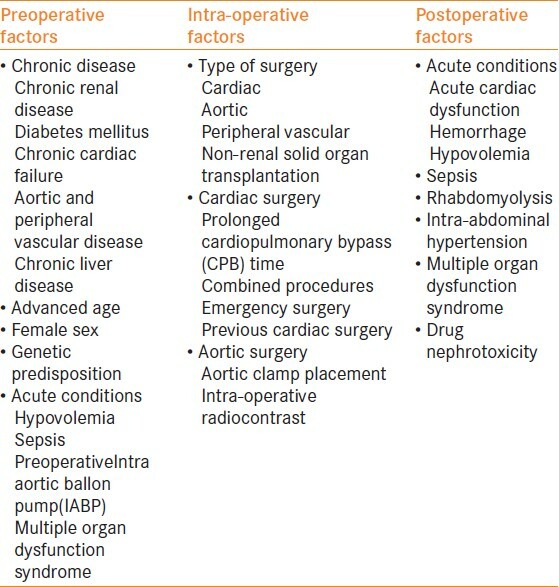 Peri-operative ARF is a major cause of morbidity and mortality. The incidence can be decreased by identifying the known risk factors like underlying medical illness, avoidance of renal hypoperfusion and nephrotoxin exposure. Traditional pharmacological interventions like dopamine, diuretics and calcium antagonists are not currently proposed drugs of choice. Mannitol and calcium may improve outcome in renal transplantation patients. Mannitol is effective in rhabdomyolysis. NAC has proven effective in CIN. Fenoldopam, vessel dilators and ANP have shown good results in prevention and treatment of ARF. The clinical efficacy of vessel dilators, growth factors, and preconditioning maneuvers are under trial and need to be assessed. 1. Mehta RL, Chertow GM. Acute renal failure definitions and classification: Time for change? JAmSoc Nephrol 2003;14:2178-87. 2. Stephen T. Webb J. Stephen D. Allen. Perioperative renal protection. Contin Educ Anaesth Crit Care Pain 2008;8:176-80. 3. Tian J, Barrantes F, Amoateng-Adjepong Y, Manthous CA. Rapid Reversal of Acute Kidney Injury and Hospital Outcomes: A Retrospective Cohort Study. Am J Kidney Dis 2009;53:974-81. 4. Bellomo R, Ronco C, Kellum JA, Mehta RL, Palevsky P; Acute Dialysis Quality Initiative workgroup. Acute renal failure-definition, outcome measures, animal models, fluid therapy and information technology needs: The Second International Consensus Conference of the Acute Dialysis Quality Initiative (ADQI) Group. Crit Care 2004;8:R204-12. 5. Jarnberg PO. Renal protection strategies in the perioperative period. Best Pract Res Clin Anaesthesiol 2004;18:645-60. 6. Lameire N, Van Biesen W, Vanholder R. Acute renal failure. Lancet 2005; 365:417. 7. Dworkin LD. Serum cystatin C as a marker of glomerular filtration rate. CurrOpinNephrolHypertens 2001;10:551-3. 8. Han WK, Bailly V, Abichandani R, ThadhaniR, Bonventre JV.Kidney Injury Molecule-1 (KIM-1): A novel biomarker for human renal proximal tubuleinjury. Kidney Int 2002;62:237-44. 9. PercoP, OberbauerR. Kidney injury molecule-1 as a biomarker of acute kidney injury in renal transplant recipients. NatClinPractNephrol 2008;4:362-3. 10. Parikh CR, Abraham E, Ancukiewicz M, Edelstein CL. Urine IL-18 Is an Early Diagnostic Marker for Acute Kidney Injury and Predicts Mortality in the Intensive Care Unit. J Am SocNephrol 2005;16:3046-52. 11. Mishra J, Dent C, Tarabishi R, Mitsnefes MM, Ma Q, Kelly C, et al. Neutrophil gelatinase-associated lipocalin (NGAL) as a biomarker for acute renal injury after cardiac surgery. Lancet2005;365:1231-8. 12. Himmelfarb J, Joannidis M, Molitoris B, Schietz M, Okusa MD, Warnock D, et al. Evaluation and initial management of acute kidney injury. Clin J Am SocNephrol 2008;3:962-7. 13. Carmichael P, Carmichael AR. Acute renal failure in the surgical setting. ANZ J Surg 2003;73:144-53. 14. Vincent JL, Gerlach H. Fluid resuscitation in severe sepsis and septic shock: An evidence-based review. Crit Care Med2004;32(11 Suppl):S451-4. 15. Trivedi HS, Moore H, Nasr S, Aggarwal K, Agrawal A, Goel P, et al. A randomized prospective trial to assess the role of saline hydration on the development of contrast nephrotoxicity. Nephron ClinPract 2003;93:C29-34. 16. Finfer S, Bellomo R, Boyce N, French J, Myburgh J, Norton R; SAFE Study Investigators. A comparison of albumin and saline for fluid resuscitation in the intensive care unit. N Engl J Med 2004;350:2247-56. 17. Boldt J, Brosch C, Ducke M, Papsdorf M, Lehmann A. Influence of volume therapy with a modern hydroxyethylstarch preparation on kidney function in cardiac surgery patients with compromised renal function: A comparison with human albumin. Crit Care Med 2007;35:2740-6. 18. Weisbord SD, Palevsky PM. Prevention of contrast-induced nephropathy with volume expansion. Clin J Am SocNephrol 2008;3:273-80. 19. Briguori C, Airoldi F, D'Andrea D, Bonizzoni E, Morici N, Focaccio A, et al. Renal insufficiency following contrast media administration trial (REMEDIAL): A randomized comparison of 3 preventive strategies. Circulation 2007;115:1211-7. 20. Recio-Mayoral A, Chaparro M, Prado B, Cózar R, Méndez I, Banerjee D, et al. The reno-protective effect of hydration with sodium bicarbonate plus N-acetylcysteine in patients undergoing emergency percutaneous coronary intervention: The RENO Study. J Am CollCardiol 2007; 49:1283-8. 21. Aronson S, Blumenthal R. Perioperative renal dysfunction and cardiovascular anesthesia: Concerns and controversies. J CardiothoracVascAnesth 1998;12:567-86. 22. Bellomo R, Auriemma S, Fabbri A, D'Onofrio A, Katz N, McCullough PA, et al. The pathophysiology of cardiac surgery-associated acute kidney injury (CSA-AKI). Int J Artif Organs 2008;31:166-78. 23. Abuelo JG. Normotensive ischemic acute renal failure. N Engl J Med 2007;357:797-805. 24. Lameire N, Biesen WV, Hoste E, Vanholder R. The prevention of acute kidney injury: An in-depth narrative review Part 1: Volume resuscitation and avoidance of drug- and nephrotoxin-induced AKI. NDT Plus 2008;1:392-402. 25. Sarubbi FA Jr, Hull JH. Amikacin serum concentrations: Prediction of levels and dosage guidelines.Ann Intern Med 1978;89:612-8. 27. De laet I, Malbrain ML, Jadoul JL, Rogiers P, Sugrue M. Renal implications of increased intra-abdominal pressure: Are the kidneys the canary for abdominal hypertension? ActaClinBelgSuppl 2007;1:119-30. 28. Bonventre JV. Kidney ischemic preconditioning. Curr Opin Nephrol Hypertens 2002;11:43-8. 29. Wijeysundera DN, Beattie WS, Djaiani G, Rao V, Borger MA, Karkouti K, et al. Off-pump coronary artery surgery for reducing mortality and morbidity: Meta-analysis of randomized and observational studies. J Am CollCardiol 2005;46:872-82. 30. Bown MJ, Norwood MG, Sayers RD. The management of abdominal aortic aneurysms in patients with concurrent renal impairment. Eur J VascEndovascSurg 2005;30:1-11. 31. Hirschberg R, Kopple J, Lipsett P, Benjamin E, Minei J, Albertson T, et al. Multicenter clinical trial of recombinant human insulin-like growth factor I in patients with acute renal failure. Kidney Int 1999;55:2423-32. 32. Bellomo R, Chapman M, Finfer S, Hickling K, Myburgh J. Low-dose dopamine in patients with early renal dysfunction: A placebo-controlled randomised trial. Australian and New Zealand Intensive Care Society (ANZICS) Clinical Trials Group. Lancet 2000;356:2139-43. 33. Kellum JA. Use of dopamine in acute renal failure: A meta-analysis. Crit Care Med 2001;29:1526-31. 34. Friedrich JO, Adhikari N, Herridge MS, Beyene J. Meta-analysis: Low dose dopamine increases urine output but does not prevent renal dysfunction or death. Ann Intern Med 2005;142:510-24. 35. Padmanabhan R. Renal dose dopamine-it's myth and the truth. J Assoc Physicians India 2002;50:571-5. 36. Weldon BC,Monk TG. The patient at risk for acute renal failure. Recognition, prevention, and preoperative optimization. AnesthesiolClin North Am 2000;18:705-17. 37. Halpenny M, Lakshmi S, O'Donnell A, O'Callaghan-Enright S, Shorten GD. Fenoldopam: Renal and splanchnic effects in patients undergoing coronary artery bypass grafting. Anaesthesia 2001;56:953-60. 38. Cogliati AA, Vellutini R, Nardini A, Urovi S, Hamdan M, Landoni G, et al. Fenoldopam infusion for renal protection in high-risk cardiac surgery patients: A randomized clinical study. J CardiothoracVascAnesth 2007;21:847-50. 39. Bagshaw SM, Ghali WA. Theophylline for prevention of contrastinduced nephropathy: A systematic review and meta-analysis. Arch Intern Med 2005;165:1087-93. 40. Rodicio JL, Campo C,Ruilope LM. Renal effects of calcium antagonists. Nephrol DialTransplant 1995;10(Suppl9):17-22. 41. Bagshaw SM, Delaney A, Haase M, Ghali WA, Bellomo R. Loop diuretics in the management of acute renal failure: A systematic review and metaanalysis. Crit Care Resusc 2007;9:60-8. 42. Bagshaw SM, Delaney A, Jones D, Ronco C, Bellomo R. Diuretics in themanagement of acute kidney injury: A multinational survey. ContribNephrol 2007;156:236-49. 43. Lameire N, Biesen WV, Hoste E, Vanholder R. The prevention of acute kidney injury an in-depth narrative review: Part 2: Drugs in the prevention of acute kidney injury.NDT Plus 2009;2:1-10. 44. Townsend DR, Bagshaw SM. New insights on intravenous fluids,diuretics and acute kidney injury. Nephron ClinPract 2008;109:c106-16. 45. Uchino S, Doig GS, Bellomo R, Morimatsu H, Morgera S, Schetz M, et al. Diuretics andmortality in acute renal failure. Crit Care Med 2004;32:1669-77. 47. Sever MS, Vanholder R, Lameire N. Management of crushrelated injuries after disasters. N Engl J Med 2006;354:1052-63. 48. Vanholder R, Sever MS, Erek E, Lameire N.Rhabdomyolysis. J Am SocNephrol 2000;11:1553-61. 49. Reddy VG. Prevention of postoperative acute renal failure.J Postgrad Med 2002;48:64-70. 50. Schnuelle P, Van Der Woude JF. Perioperative fluid management in renal transplantation: A narrative review of the literature. TransplInt 2006;19:947-59. 51. Vesely DL. Natriuretic peptides and acute renal failure. Am J Physiol Renal Physiol 2003;285:F167-77. 52. Lewis J, Salem MM, Chertow GM, Weisberg LS, McGrew F, Marbury TC, et al. Atrial natriuretic factor in oliguric acute renal failure. Anaritide Acute Renal Failure Study Group. Am J Kidney Dis 2000;36:767-74. 53. Mentzer RM Jr, Oz MC, Sladen RN, Graeve AH, Hebeler RF Jr, Luber JM Jr, et al. Effects of perioperative nesiritide in patients with left ventricular dysfunction undergoing cardiac surgery: The NAPA Trial. J Am CollCardiol 2007;49:716-26. 54. Clark LC, Farghaly H, Saba SR,Vesely DL. Amelioration with vessel dilator of acute tubular necrosis and renal failure established for 2 days. American Journal of Physiology. Heart CircPhysiol 2000;278:H1555-64. 55. McCullough PA. Contrast-induced acute kidney injury. J Am CollCardiol 2008;51:1419-28. 56. Birck R, Krzossok S, Markowetz F, Schnülle P, van der Woude FJ, Braun C. Acetylcysteine for prevention of contrast nephropathy: Metaanalysis. Lancet 2003;362:598-603. 57. Hoffmann U, Fischereder M, Krüger B, Drobnik W, Krämer BK. The value of Nacetylcysteine in the prevention of radiocontrast agent-induced nephropathy seems questionable. J Am SocNephrol 2004;15:407-10. 58. Khanal S, Attallah N, Smith DE, Kline-Rogers E, Share D, O'Donnell MJ, et al. Statin therapy reduces contrastinduced nephropathy: An analysis of contemporary percutaneous interventions. Am J Med 2005;118:843-9. 59. Sturiale A, Campo S, Crascì E, Aloisi C, Buemi M. Experimental models of acute renal failure and erythropoietin: What evidence of a direct effect? Ren Fail 2007;29:379-86. 60. Veys N, Van BW, Lameire N. Internal medicine, renal anaemia, and erythropoiesis-stimulating agents (ESAS). ActaClinBelg 2007;62:396-?407. Bajwa, S.J.S. and Kalra, S.